In reading all the responses to the SMS giveaway, I've learned about lots of thoughtful quilt presents that you all have given to your loved ones. Quilts were by far the most popular favorite gift you all have given! That made me think back to the last quilt before my sewing accident. I had a sewing accident. Not lately, but almost seven years ago. I'll tell you the whole gory story. I used to quilt. I liked quilting. I was a machine piecer, hand quilter. I have a quilt on my bed at my parents' house to prove it. When my grandparents' 50th anniversary began approaching, I decided to make them a photo quilt. I picked the photos, treated and printed and treated the fabric, and cut the other pieces. I was trimming the photo fabric into squares in the bathroom (hard floor) one Saturday in April when the rotary cutter hit a nick in the ruler and took a bad angle toward my outstretched hand. Don't read this if you have a weak stomach. WARNING! I actually saw a piece of my finger roll away and I've never seen so much blood come all at once. I screamed for my dad (who was, thankfully, home). He picked up the piece of my finger and put it in a baggie and drove me to the hospital with a piece of my finger in his pocket. Shudder. I know people have had much worse happen to them, but it was pretty horrific to me at the time. I have since had the privilege of going through childbirth. When I think of pain, I do not think of childbirth. I think of this ride to the emergency room. They couldn't reattach the sliced finger. Lest you think I have half my finger missing, it was only the tip of the finger (nail and fingertip at an angle). I spent 2 months with a very large bandage on my finger and my finger sticking up straight in the air (my index finger). I taught preschool at the time and preschoolers are not the people you want around you with an extremely painful finger injury. And there was a field trip laced with Vicodin in there somewhere. I had to tell people that my finger was cut off in a sewing accident. I have a bum finger to this day. Parts of it have no feeling and parts of it are painful depending on what I'm doing. It's slightly disfigured, but only if I point it out to people do they notice. That was my last quilt and it's in a bag in my craft room closet. I got ZERO blood on any part of the quilt. I now have attached safety shields on all of my rotary cutter rulers. My husband's favorite thing about me might be that I've had a sewing accident. I've filed this under "quirky." It's difficult to take a picture of your own finger. It looks relatively normal when my nail is short! That's my sewing injury confession. I feel guilty that the quilt was never finished. :( Maybe I just need some motivation to revisit it. 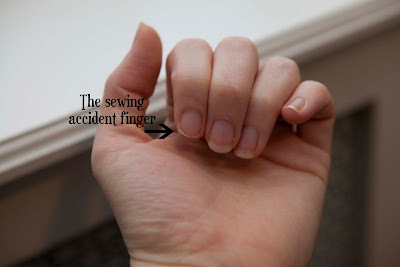 Sooooooo......tell me your worst sewing/crafting accident! Cringe! Ugh! I'm glad you're okay now. I haven't done much crafting in my life, but I do have a healthy fear of rotary cutters—and more so now! I guess the closest thing to a crafting accident (aside from needle pricks) I can think of is this: my sister and I were poking holes in a jar lid for bugs when we were young. I had her hold the jar while I went at the lid with an ice pick—you can see where this is going, right? I went clear through the web between her thumb and index finger. It looked nasty, but miraculously, it healed beautifully. That's terrible! Right away I started thinking about the times we've gotten together and whether or not I noticed you having less amount of finger than other people. lol. Mine was really stupid. I was very pregnant and I think my hands were swelling. I used these stupid little scissors to cut out a bazillion (slight exaggeration) fabric flowers for baby bedding and didn't notice my hand going numb. I didn't have feeling in that finger for ages. Luckily it is back now. Not sewing related, I once accidentally stabbed a pencil into my leg and have a little "pencil lead" tattoo there, lol. I did almost exactly the same thing, on the same finger. I was rotary cutting when I was really too tired and slipped and cut it through on an angle from the bottom to the top about an inch worth. I was lucky because I saw it slip and started to move my hand or I would have cut the whole top off under my nail, gross! I never bled so much in my life. We used first aid tape to hold it together because I didn't want to go get stitches. It is cool how the piece grew back together on it's own, but it feels so strange like it doesn't belong there without feeling in it. ewwwww! The worst I've done is stabbed myself with the sewing needle. Then again, I've only been using a rotary cutter for less than 6 months! I'll be super careful now! Oh my goodness. I think I nearly passed out just reading about your sewing accident. I can't even begin to imagine how upsetting it was to live through. My worst sewing accident... Um. Probably when I was in college. I was studying costume design and sewed a LOT of costumes for a LOT of plays and, one day, got my finger caught in the serger. I didn't stitch through it, thankfully, but I got a pretty good nick from the blade. Bled on the costume a little bit (we always said that made a costume lucky), but mostly it was just really scary. Haha! I got my finger cut when i was a baby(thanks grandma;))! Oh yeah, then there was the time when the Bro and tried to cut almonds whith a prunig shears...( ok sissy, you hold the almond in i wil cut it... CLUNK oaaaaaawwwww!